I have two 50cc saws. An Echo CS490 and a Stihl MS261. The Echo is a nice saw, but the Stihl feels like it has more power. 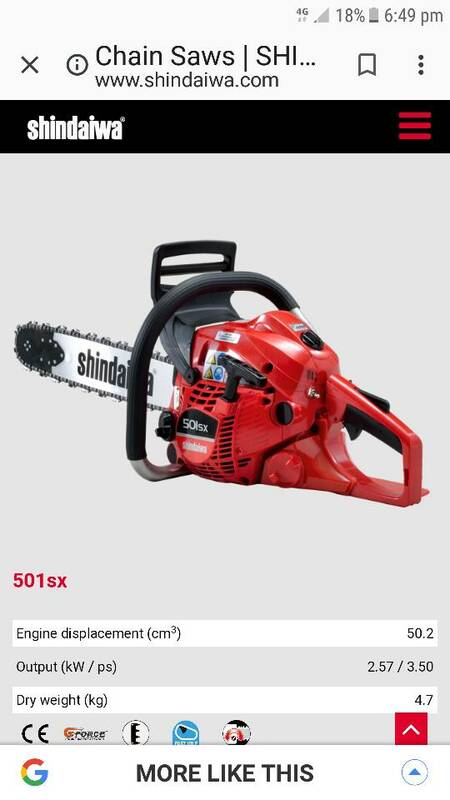 And almost double money,at least in my country.You are going to need a loan if you decide to buy anything from Steal,i mean Stihl.500€ for the 501SX and 825€ for the 261 C-M.There is nothing that can can justify this price difference.More power to do what?To cut cookies 2 seconds faster?Nothing against you or the saw but i had to say this..Everything is about the price/perfomance for me,in Greece the best performance/price ratio for the 50cc goes to the Dolkita,500€ for the Makita EA5000P.I was this close to get one but then i found a NIB CS 490 on Ebay for 230$,how to say no to this? chipper1, BGE541 and farmer steve like this. Kostas, please dont think I was taking a dump on Echo. I like my CS490 and it's a solid saw. No doubt Stihl is more expensive, but that was not the OP's question. Both a fine saws. chipper1, farmer steve and Kostas like this. If you REALLY want to spend Stihl money, buy 2x Echo 490.
chipper1, BGE541, James Miller and 1 other person like this. I’m a stihl guy ‘cause there’s never been a husky dealer close. My ms261cm is great. I needed a new trimmer about 30 years ago and I went to the husky dealer about 15 miles from me. The place was empty, so I ended up with a stihl. One of these looks good. chipper1, BGE541 and champion221elite like this. True words. The Stihl MS261cm is $1400 in Australia. The Shindaiwa SX501 is $1000. chipper1, farmer steve, pavel408 and 1 other person like this. chipper1, BGE541, James Miller and 3 others like this. Partner 5000+, Jonsered 490/590, Poulan 325 and especially the Jonsered 2051 are the 50cc saws I'd rate as the strongest. And my MMWS 346 BE ain't exactly what is call a weakling. All of the saws mentioned are REALLY, REALLY wicked when ported. chipper1, deedskelly and holeycow like this. BGE541 and sawfun like this. The 261cm with it's stratos gutted, muffler baffle removed, and an ignition advance is a stunningly strong saw. I feel it's one of the very few saws ever made that can be made to run like it's ported without ever porting it. farmer steve, Mygalomorph and sawfun like this. What do you mean Strato Gutted? I agree with JJ that since you love the Stihl line-up, the 261 v2 makes a lot of sense of certainly fall into that bad... bucket, my buddy has one and it rips, in stock form. Not sure if some of these others do....yes they do have power and realiability, but also i think the sound and the look of the saw is a factor, is someone else going to walk up and be like, oh man that is bad... I personally like the orange and gray combination on the husky 550xp, haven't run the Mark II but i think they look sweet, they may not be as nimble as the original or the 346 but that is what your 241 is for. Curious what the price for the new 550xp is down under? 346xp oe or ne doesn't mater. chipper1, TimberWolf530, milkman and 1 other person like this. But I got a 550xp last fall that has run flawlessly. Wait - some Stihls have hot start issues, too? I had a Stihl 'solenoid' (they seem like a new, magical component - must be a problem in your flux capacitor gear in there, son) very quietly and frustratingly replaced on a brand new saw once upon a time not all that long ago. Dealer said they just "pushed the reset button" but I don't really believe him. That should have taken - one hour, not one month. Not really a very good shop at all though, so who knows. They don't even stock 'pro' models on a daily basis. "Nobody buys those." I do want to put a 261 in my hands but will have to drive quite a ways to do it. Remove the partition on the cylinder side of the carb, cut the panel that disects the intake into strato and fuel halves, and pow - stratos gutted. Basically, it will take in some mix during the strato cycle, and allow more air during the mix cycle. It's sort of like your carb is suddenly a large venturi...sort of. But you need to make the saw draw more air(flow better) in in order for it to work well. chipper1, grizz55chev and sawfun like this.